From release 44 (launched in August 2017), AODocs is replacing the Versions menu on workflow states with a new type of workflow state, Draft, and different types of transitions. This means that AODocs will gradually deprecate the Versions menu of the workflow states, beginning in release 44. What is changing with release 44? In release 44, the Versions menu is no longer displayed in workflow states where the Do nothing option is selected. Also, newly created workflow states don’t have a Versions menu. AODocs will continue to support workflow configurations that use the Versions menu until release 46 (expected for the end of year 2017). After this version, workflow configurations using the Versions menu will no longer work. 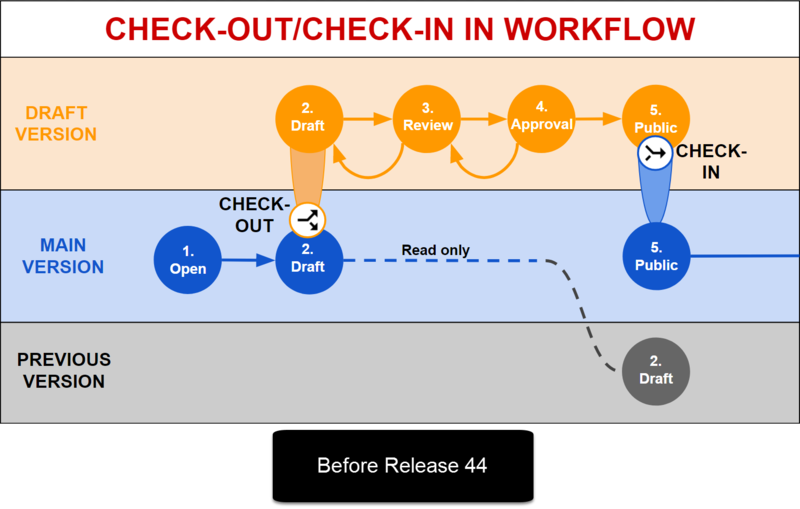 Check-out / check-in and Discard check-out actions happened on the document when the document entered the workflow state configured with the Versions menu. 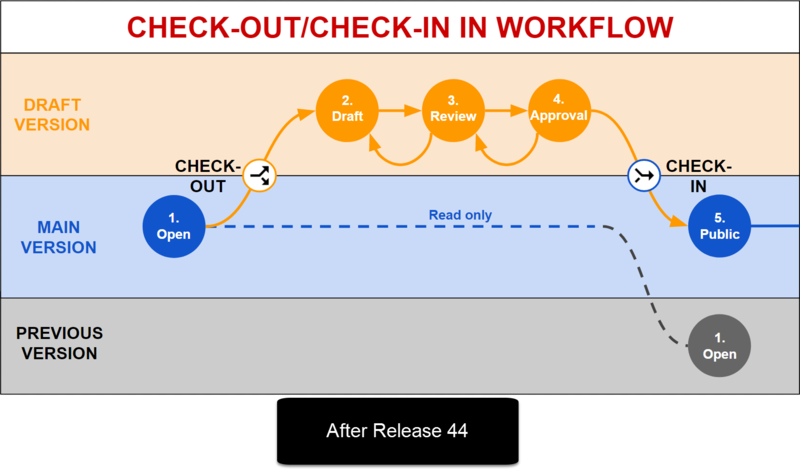 Check-out / check-in happen during workflow transitions. The main version had the first workflow state of the draft version. The main version doesn’t take the first workflow state of the draft version. 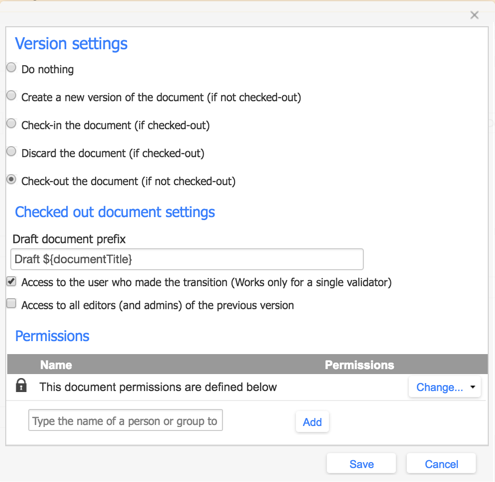 Permissions for the main and draft versions were complicated because they were managed both in the Permissions menu and the Versions menu. There are two types of state: Draft and Standard. All workflow permissions are managed in the Permissions menu on the workflow state. The Versions menu no longer exists. Human errors combining manual and workflow automated check-out / check-in caused the wrong permissions to be applied to the document. The workflow state of a document is frozen if it has been checked-out manually. Manual check-in is forbidden if the check-out is triggered by a workflow transition, to limit human error and loss of permissions. Automatic discard can be configured in the workflow configuration. For the moment, a check-out can be canceled (draft discarded) only manually. The upcoming release of AODocs will restore this capability. Administrators can no longer manually force a workflow state from Standard to Draft (or the reverse). They have to follow the workflow actions. How to migrate your workflow to the new engine? For help with your migration and to find out about best practices, contact the AODocs support team.